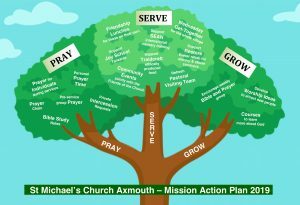 Axmouth Church seeks to be a blessing to the village of Axmouth and to have an impact in the wider world. This is our mission statement. Put another way, it’s a simple reminder of what we are here for. Everything we do as a church should be in harmony with it. You can read full details of every facet of our activities from the site menu under the heading “What We Do”. Just select the one that interests you. The bit that follows is our attempt to explain a bit more about why we do these things. To help us focus, we have a Mission Action Plan, setting out the things we do, or aim to do, to make sure we get there. This is it! 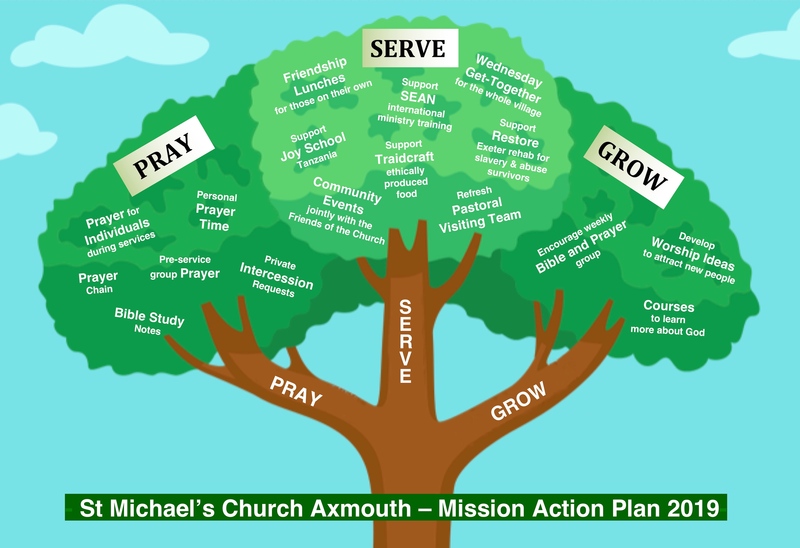 In broad sympathy with the aims of the whole of the Exeter Diocese to which we belong, our action plan is under three headings: Pray, Serve and Grow. Prayer is the bedrock of the Christian faith. In the direst of situations, when it can seem there’s nothing we can do, we can always pray. We can pray for ourselves and for other people, in private and along with others. We do all these things and it works: not always as you might expect but always in a way that does good. If in doubt, use the Lord’s Prayer, as taught by Jesus Christ. 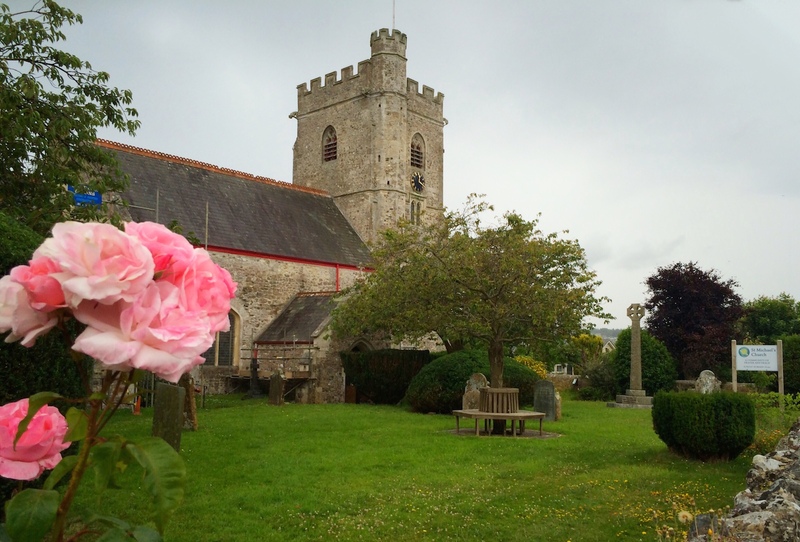 For the village of Axmouth, there are church services of course, every Sunday morning and on special occasions. But we also run a weekly Wednesday Get-Together, normally in the Village Hall. Coffee and company are the watch words, although it can be tea and biscuits! There’s no charge, it’s simply a focal point for anyone in Axmouth. We organise monthly Friendship Lunch meetings for people on their own. And we’re working on improving our pastoral activities so that anyone who would like a home visit can have one. For the wider world, we put on fundraising events under the banner Making Waves. We have been able to make worthwhile gifts to three specific causes, which we review every year. Current beneficiaries are an Exeter charity helping victims of modern slavery to get back into normal life, an impoverished school in Tanzania with which we have a local connection and an international ministry founded 40 years ago in Axmouth Church which trains emerging churches across the world with tools to equip and empower them. We are always trying to learn more and do more. We want people who already take part in church life to be enriched by it. We want those who don’t to be encouraged. That requires us to grow, both ourselves and the things we do. This year we’ve developed a Bible and Prayer Group that meets each Friday morning in the church. Anyone can come. You’ll be made welcome. We chat informally about the Bible passage set for the coming Sunday service and ponder its contemporary relevance, what it is actually saying to each one of us today. We also pray as a group for anyone who would like it, including prayer requests that have been left in the church during the week. There is always more for us to do. That’s why we have a Mission Action Plan. If you have any comments or suggestions for us, please let us know. We’re your church.